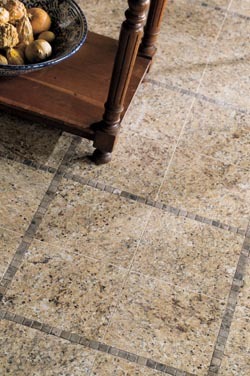 Choose versatility in the flooring for your home or business. Select timeless tile for its value and appeal. Our local store carries a handsome array of tile flooring in an abundance of brands, colors, shapes, and sizes. This flooring classic works well in any room and with all decorating styles. We insist on brand-name flooring for our customers. When a product has a brand name, you are assured of innovation, quality, and style. We carry a number of brand names of tile, among them Floorcraft™ and Star Values™. These brands are known for beauty, longevity, and value. Tile offers a wide array of benefits for those who choose this flooring option. This flooring is as tough as it is attractive. Remodeling with tile gives you two main options: Go subtle with tiles of the same size, color, and pattern; or go bold with tiles in differing colors, shapes, and patterns. Either way, you cannot go wrong with this flooring favorite. Remodel your favorite room with the elegance of ceramic tile flooring. Give any space a look of refinement and grace and increase the property value of your home. Ceramic tile flooring is softer than other types of tile, which makes it easier to cut and install. This is also the tile with the smallest price tag. Porcelain tile offers a contemporary beauty that complements any décor. This type of tile is denser and harder than ceramic and costs a little more. Porcelain is tile at its best, requiring little in the way of cleaning and maintenance, while offering strength and durability. Rely on porcelain tile to resist water, fire, frost, and remain beautiful. Slate is tile that is quarried from natural stone. As you expect, this flooring is dense and heavy. Available in blue, gray, green, rust, and gold; slate tile offers a rustic appeal. What our customers love about slate is that each tile has its own unique look and appeal. The whorls, patterns, and variations make this flooring option endlessly fascinating. The flooring experts we send to your home or place of business install your tile with precision and accuracy. These professional have their training and experience to truly excel at tile flooring installation. Such skills are essential for tile flooring that looks appealing and lasts for years. Mistakes show up glaringly with tile due to its straight lines and subtle colors. To begin, these professionals remove and dispose of your old flooring and prepare the subfloor. Once this is ready, they trowel mortar and place the individual tiles. To keep the individual tiles from touching, they apply a strip of grout in-between. Tile installation that is done correctly results in tile that adheres securely to the mortar and does not shift out of place. When the latter happens, tile can crack, chip, or break. Contact us today for new ceramic, porcelain, or slate tile for your home. We proudly serve Lethbridge, Claresholm, Cardston, Raymond, and Magrath, Alberta, Canada, and the surrounding areas.